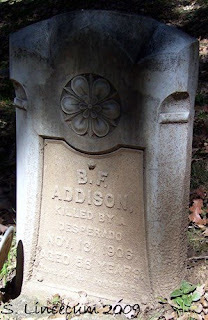 Mr. Ben Addison, a black merchant, was laid to rest in the designated "colored" section of Riverside Cemetery in Asheville, Buncombe County, North Carolina. On the cold winter night of 13 November 1906, a crazed drunken man named Will Harris went on a shooting rampage that left five men dead. One unfortunate victim was Ben Addison. Mr. Addison owned a store at 53 Eagle street in downtown Asheville. He was shot when he opened his door to see what the commotion was about.